Arsenal have been handed some great news with reports emerging that Jack Wilshere is set to accept a new contract offer from the North London club despite being offered a pay cut. The England international is due to be out of contract at the end of the season and would have been a big loss to Arsenal should he leave on a free transfer. 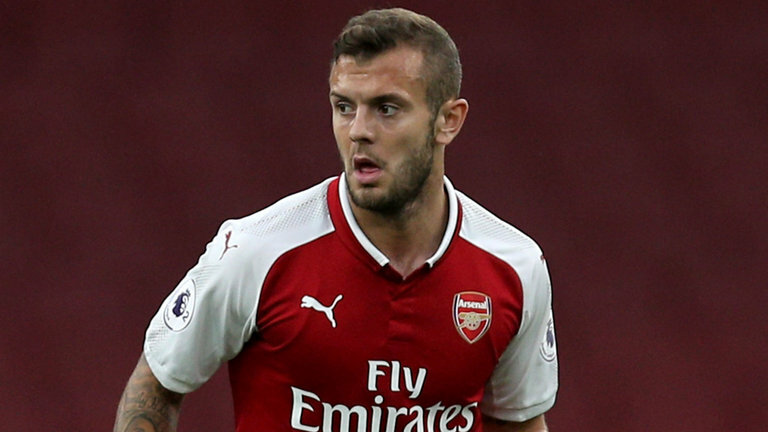 According to report garnered from the Telegraph, Wilshere look close to finally renewing his contract with Arsenal by putting pen to paper on a reduced wages to reflect his poor recent injury record, with Wilshere set to drop down to earning around £90,000 a week, though with the potential to still go back up to his current £110,000. Tottenham Hotspur host Arsenal in the North London derby on Saturday (12:30pm). Looking for betting tips and match preview, click here for the best offers. Wilshere’s new deal contract would be more positive news for the fans after what turned out to be a reasonably strong January transfer window, with Arsene Wenger doing brilliantly well in replacing Alexis Sanchez, Olivier Giroud and Theo Walcott. Pierre-Emerick Aubameyang and Henrikh Mkhitaryan were brought in at the Emirates Stadium, while the Frenchman also managed to tie down star playmaker Mesut Ozil to a new contract. The England international joining Ozil in extending his stay at the Emirates would be another significant boost for Arsenal as they need to keep what remains of the core of his squad together. With plenty of recent changes to the team, Arsenal’s stability is important for the Gunners as they start to plan for next season already. Wilshere has always looked a top class performer when fit, and he’s shown this season that the worst of his injury issues seem to be behind him. According to Liam McCoy of http://www.footballhitz.com/ blog updated daily with Football News relating to top European football clubs has picked a report from The Sun that claims Liverpool are plotting a move to sign Arsenal’s and England international Jack Wilshere. Liverpool are reportedly to move in for Arsenal’s Jack Wilshere for free in the summer if the England international fails to sign a new Arsenal contract, according to a report in The Sun. The British tabloid claim that the England midfielder is currently locked in talks with Arsenal over renewing his contract that expires in the summer, and the North London club are set to offer him a new deal that would seem him earn less than his current £90,000-a-week wage. The newspaper report that Reds boss Jurgen Klopp is a huge fan of Wilshere and that the Merseyside will make a move for Wilshere if he becomes a free agent as Klopp sees him as the ideal replacement for Emre Can. Can, according to the report, is not expected to sign a new contract with Liverpool that would see him remain at Anfield beyond the summer, with Serie A champions Juventus keen on signing the Germany international. Arsenal however, are expected to offer Wilshere a deal which will see him paid on appearances and performances due to his injury record, but Liverpool would be willing to match his current £90,000-a-week deal to secure his signature. The strongly in-form 26-year-old midfielder has registered 26 appearances for Arsenal this season, netting two goals as well as notching five assists. Wilshere will be a good move for Liverpool if they can get the midfielder on a free transfer. Klopp worked wonders with ex-Arsenal Alex Oxlade-Chamberlain and if the German boss could help his former team-mate fulfill some of his potential, then his side would be better for his arrival. Liverpool look set to lose Can this coming summer, so signing a replacement for free would be a smart piece of business for the club. However, Wilshere doesn’t seem likely set to leave Arsenal despite the reported shortage of wages that would see him miss out on his current £90,000-a-week wage, it’s hard to imagine Wilshere choosing to leave the club. He has always looked like having his heart fixed with Arsenal, and it wouldn’t be a surprise if the 26-year-old opted to take a huge cut to his wages in order to make that dream come true. ArsenalTalk it’s here again bringing you news, opinion and humour on a daily basis. Despite the frustrating draw, we saw our side through to next round of the Europa League after a goalless draw at home with Red Star Belgrade. A half-full Emirates Stadium oversaw a disappointing game which could have been won by either side. Jack Wilshere, who impressed once again, was for unable to help Arsenal score a goal. There had been calls for Wilshere to be recalled to Gareth Southgate’s squad, but the England international omission means he still has plenty of work to do. We were all on the edge of our seats when it appeared the midfielder had suffered another injury. Wilshere who has a long history of bad luck went down after colliding with a Belgrade forward. He punched the ground in frustration and the whole of Emirates held its breath. Fans were covering their eyes, but thankfully the 25-year-old picked himself up and ran it off. Let’s take a look at how fans reacted to the incident on Twitter…. Horrible tackle on Wilshere. He's not at fault there whatsoever. I hope Wilshere never gets injured again. Ever. Arsenal will be back in action when they travel to Manchester and face Pep Guardiola’s Manchester City side in the Premier League game week 11. Get the latest free bets tips on Arsenal winning at the Etihad on Sunday and compare free bet offers. Arsenal defender Per Mertesacker says that it is his responsibility to make the club’s players want it more. Speaking before our take on Everton this weekend, the German reflected on the disastrous defeat against Watford, when we were 1-0 up but lost 2-1 late on after an awful second-half performance. The club captain had a different opinion to Arsene Wenger and Jack Wilshere, when he claimed that his team-mates need to start being better prepared mentally for games. “Even if you’re exhausted, even if it’s a game where you think you have to make every single step possible to avoid chances, you do it,” Mertesacker told Arsenal Player. “They [Watford] were coming for us and were having a real go at us. “Then you need numbers, you need players in the box and players wanting to defend that goal. We lacked that, totally, especially on that second goal. Visit Football Weeks for latest insightful football opinions and analysis by clicking on the link…..
Arsenal’s and England international Jack Wilshere believes he has never been fitter as he attempts to convince manager Arsene Wenger he is worthy of a Premier League return. The 25-year-old made a full recovery from a broken leg just few days to the international break. Wilshere played the full 90 minutes for Arsenal in the Carabao Cup win over Doncaster Rovers and Europa League success against Belarusian side BATE Borisov. It was against the Zholto-Sinie (Yellow-Blues) where the Englishman showed shades of the form that saw him regarded as one of England’s brightest young players when he first broke through at The Emirates. The playmaker showed a performance that Wenger described as “outstanding” in a 4-2 win, which has raised speculation over whether Wilshere will be awarded a new contract. Wilshere, who spent the whole of 2017/18 season on-loan at AFC Bournemouth current deal with the Gunners expires in the summer of 2018, has been set a deadline of December to convince the club he is worthy of a new deal, which he can only justify with regular appearances and an injury-free season in the team. He is hopeful that run can start when the Premier League fixtures resumes this weekend, with Arsenal facing Watford at the Vicarage Road, having returned to the best physical shape of his career. “I always hear the boss say it is my first five-metre burst, when I receive the ball and to get away from defenders and I feel that’s getting better and better each day,” he told Arsenal’s official website. “I feel like the way to improve that is in games when you’re playing against opposition that want to win and want to win the ball back and you have to be able to keep the ball. Speculation regarding the England international’s return to full fitness comes from an on-going report that defender Shkodran Mustafi could be out of action for an extended spell away from the Gunners first team after limping out of Germany’s World Cup qualifying win over Azerbaijan. Manager Joachim Loew suspects he has suffered ligament damage, but there has yet to be any confirmation over the severity of the injury he sustained.